Orcas and dolphins and turtles are just the start of what awaits you at SeaWorld San Diego. Dive into the amazing world of underwater life and feed some sea lions, or get up close to playful penguins. Learn about the unique creatures that call coastal tide pools home. Then hop on thrilling rides like Sea Star Spin and Manta - the world's first multi-media double-launch coaster. 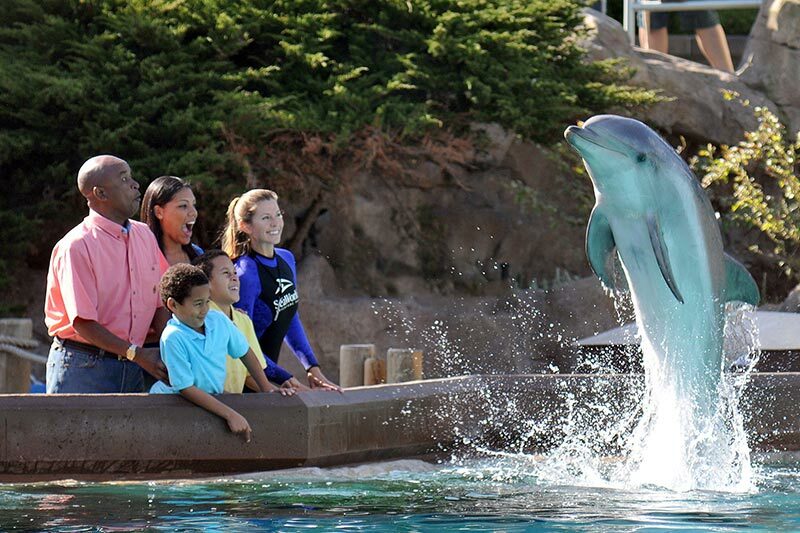 SeaWorld San Diego guarantees a full day of family fun and adventure. Vary by season, but typically the park is open from 10:00 a.m. to at least 10:00 p.m. during the summer. Where can I eat at SeaWorld San Diego? Satisfy every craving with nine great dining options. Enjoy coffee and delicious sweet treats or a fresh smoothie. Take a break with delicious bbq, ribs, pizza, pasta or salad. Treat yourself to great desserts and island treats. Then dine with orcas for an unforgettable, chef inspired dinner on the poolside terrace. What's the best way to do SeaWorld San Diego? The best way to do, see and experience SeaWorld starts with planning ahead. Download a free SeaWorld app for your phone which gives you essential in-park information. Then get to know the park and find your favorite activities. With so much to see and do, we recommend a multi-day visit to enjoy it all.